Are trapped ghosts inside the Milton Schoolhouse? Are there mysterious spirits, unrelated to the legend, that call the Milton home? Or perhaps there has never been a ghostly presence in the building. Join me as we chat with Milton co-owner, Meredith, as well as previous guest, Ginger Collins-Justus. Paranormal or not, you MUST visit the Milton and see its current reincarnation! Demonologist Keith Johnson was one of the first to investigate the now famous farmhouse that inspired the movie, The Conjuring. He has also been featured on paranormal television shows, such as Syfy’s Ghost Hunters. His experience at the now famous farmhouse in Rhode Island was all before Ed and Lorraine Warren showed up on the scene. Keith shares the truth about Bathsheba, whether the farmhouse is still haunted, a response to the current owner speaking out, plus some behind the scenes controversy involving the Warrens. In an upcoming episode of Syfy’s 10th season of Ghost Hunters, T.A.P.S. visits a city I love and know well — St. Charles, Missouri. I’ve been waiting patiently for this special episode, and I’ll give you a heads up on the locations and stories you’re likely to see. Also, check out “Ghosts of St. Charles“, a great book by Michael Henry! Syfy’s Ghost Hunters Loses Adam, Amy, and Britt! 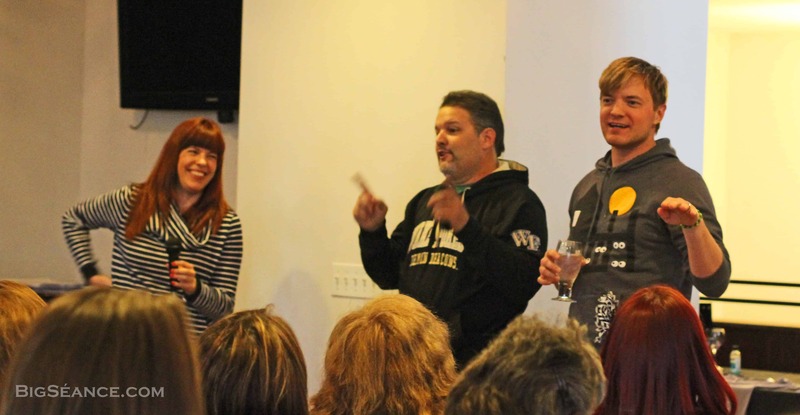 Amy Bruni, Britt Griffith, and Adam Berry speaking to the crowd at Belvoir Winery earlier this year. Last Thursday, Deadline.com reported that Adam Berry and Amy Bruni, both very popular T.A.P.S. investigators and cast members of Syfy’s flagship show, Ghost Hunters, would not be returning for another season. The site also reports that the two are teaming together on a new show. Two days later, Britt Griffith put a statement out on Facebook saying that he would also not be returning. Adam and Amy’s statements are similar, but all three are below. My thoughts on their exits are at the end of this post. First, there are some amazing episodes of Ghost Hunters that will be airing in October with me and Amy including the 200th episode which is a great milestone for GH, SyFy and Pilgrim Films! We were not fired. We were not “let go” – we opted to move on. This was 100% our decision that we came to after some discussion with the production company. Last but not least, thank you SyFy!!! You are one of the nicest, loyal and amazing networks to work for. Thank you for your continued loyalty throughout Amy and I’s entire run with Ghost Hunters. I look forward to the future. In light of some information that came out yesterday, I feel I need I clarify some things to everyone. First of all, there are a number of great episodes of Ghost Hunters featuring Adam and myself that you haven’t seen yet. They will be airing on SyFy in October and I hope you will tune in! So no, you have not seen the last of us on GH. thing I’d ever done. As she has grown older, it only became more difficult. so much at home to do so. family, have been nothing short of amazing. open for projects that don’t require so much time away. this path that led me straight to everything I hold dearest in life. Best of luck to the TAPS team, SyFy and Pilgrim Films with continued Ghost Hunters success. A bunch of you are asking me if I to am leaving#GhostHunters just like Amy and Adam. The short answer is; Yes…. It was an honor to work for Craig, Mike and Ita at Pilgrim Films and i wish them and SyFy nothing but success. For me, I will continue to produce movies for Micro Bay Features and may even take on an acting role or two;) You can see our work in Black Dahlia Haunting, Dead Sea and House of Manson. I would like to thank all of you for your support over the years. You guys rock!! Outside of their statements, I have no other information regarding future projects for these guys. Can Ghost Hunters, a show that has forever changed the way the world views the paranormal, survive without these three popular faces? As a fan, I certainly hope so! But all this change worries me a bit. Perhaps the good news is that Pilgrim Studios has officially begun searching for at least one new paranormal investigator. I can tell you that I’m so very glad I had the opportunity to meet all three of them, and I will truly miss seeing them work together on the Ghost Hunters series. I have no doubt they’ll be successful in whatever the next journey is, and I wish them all luck! Previous posts from the Belvoir Winery T.A.P.S. Event with Adam, Amy, Britt, and Chip Coffey! Amy, Adam, Britt, and Chip! TAPS and Chip Coffey at Belvoir Winery in March!